The demonstration in a leafy enclave of Cairo was one of many protests and strikes that have sprung up in Egypt as people voice their grievances for the first time after Mubarak's heavyhanded reign over the last three decades. The rally was raucous but peaceful. 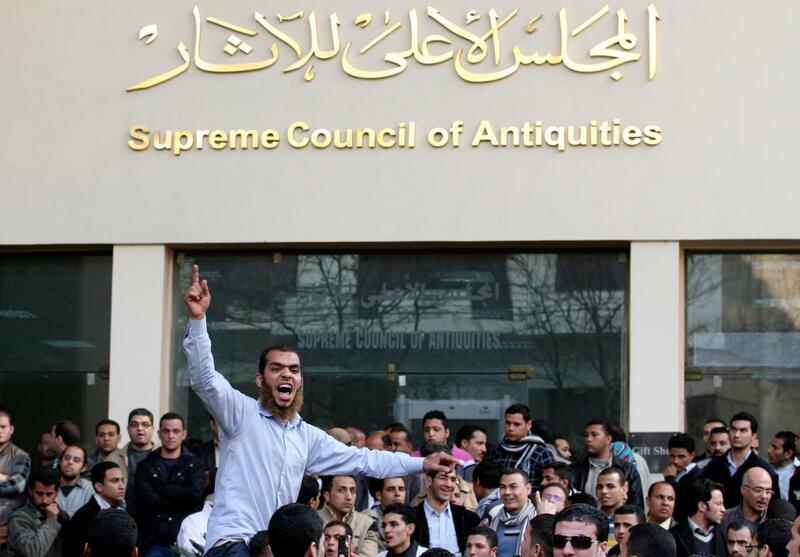 Several soldiers blocked protesters from entering the Supreme Council of Antiquities building in the Zamalek district on an island in the Nile that was largely spared the chaos that gripped Cairo. An armored personnel carrier parked in the street, a helmeted soldier poking out of a hatch. The minister did not appear, and a roar of disapproval swept the crowd when someone said he had slipped out the back door. Then there was a rumor, unconfirmed but no less damaging to his image, that his car had clipped a pedestrian. The protesters dispersed at dusk, and promised to return. The graduates said the antiquities ministry had offered them three-month contracts at 450 Egyptian pounds ($75) a month, hardly enough to survive. They noted that Egypt's tourism industry is a major foreign currency earner, and yet it was unclear how exactly the government was spending the income. A foreign tourist spends up to 160 Egyptian pounds ($27) to visit the pyramids of Giza and descend into a tomb there, said 25-year-old Said Hamid. Multiply that, he said, by the thousands who used to visit daily until upheaval drove away foreign visitors and plunged the lucrative industry into crisis. . . . These protests come after Zahi Hawass has revealed that 18 objects had been removed from the museum, though some may have been returned. Hawass is a showman. He has garnered a great deal of attention, and also raised the profile for Egypt's heritage, and its calls for repatriation. But in the new Egypt, will that approach still be suitable? I can understand the frustration of recent graduates, angry that they are paid very little. How will this shape the relationships Egypt has with foreign archaeologists? The Associated Press: Protesters target Egypt's antiquities chief, February 14, 2011, http://www.google.com/hostednews/ap/article/ALeqM5gNv6IKRhurEYPmjAzVk86a0tsX8g?docId=d818e386afeb449d988b51bc767e96d7 (last visited Feb 14, 2011).